Processing: Stacked in CCDStack, balanced, curves, highlights sharpening and diffraction spikes added in Photoshope CS5. Text from APOD: M7 is one of the most prominent open clusters of stars on the sky. The cluster, dominated by bright blue stars, can be seen with the naked eye in a dark sky in the tail of the constellation of the Scorpion (Scorpius). M7 contains about 100 stars in total, is about 200 million years old, spans 25 light-years across, and lies about 1000 light-years away. The above deep exposure was taken from Hakos Farm in Namibia. 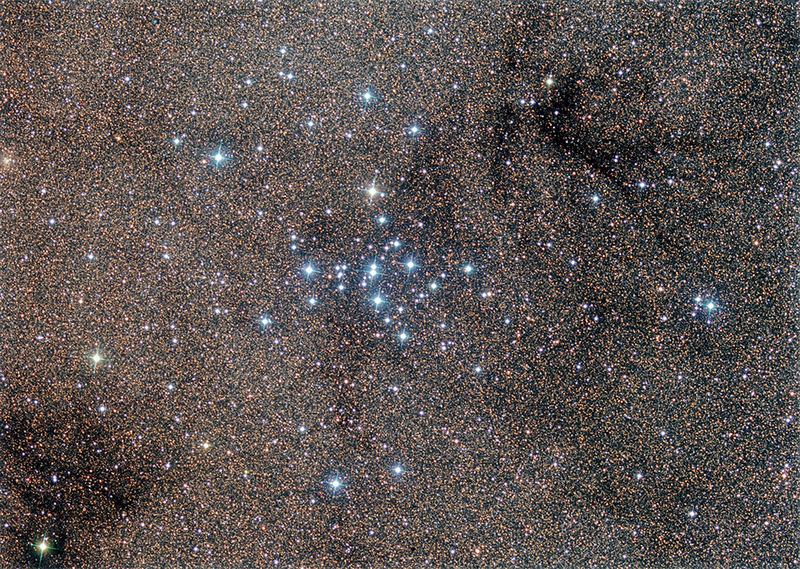 The M7 star cluster has been known since ancient times, being noted by Ptolemy in the year 130 AD. Also visible are a dark dust cloud and literally millions of unrelated stars towards the Galactic center.